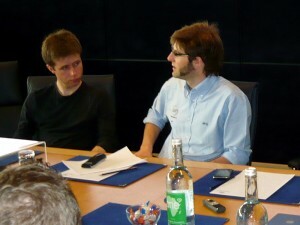 Brits on Pole’s Andy and LJH were invited by Williams F1 sponsor Philips to join other bloggers and web journalists for a tour of the team’s factory in Grove, Oxfordshire. The aim was to brief us on their competition to allow an ordinary fan to drive an F1 car but, while there, we also toured parts of the factory, interviewed technical director Sam Michael and visited the team museum. All in all we were there for half a day – here is what it’s like to be behind the scenes at an F1 factory. 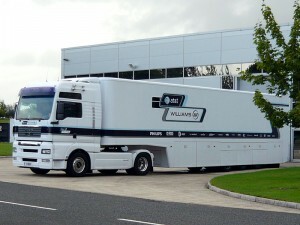 Visit this page on the Williams F1 website and you can track our visit for yourself via its interactive tour. 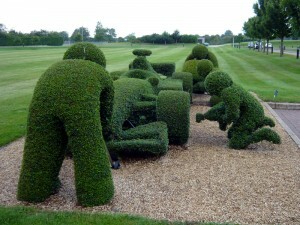 For any visitor to Williams F1 headquarters, the clearest proof awaiting them to show they haven’t blundered into any one of a thousand anonymous industrial estates is the topiary. Clipped into the shape of a F1 car and four pit crew, it sits outside the conference centre as a clear statement of ambition and originality. It’s also the first thing all of us see as we make our way in for our visit. After a brief breakfast and introductions, our tour starts with a walk across the car park from the rendezvous at the conference centre to the main facility. On the way in we hear a bit about the career prospects of Nico Hulkenberg – extremely hopeful by the sound of things, which leaves us wondering about the long-term security of Kazuki Nakajima as Williams follows Toro Rosso’s example and opts for two drivers with the same name. Like Heikki Kovalainen at McLaren, what mainly seems to impress is Hulkenberg’s attitude, including his approach to his fitness regime, with much time spent in the on-site gym and also in improving his skills in the simulator. The two are near each other and drivers are sometimes sent panting from the former to the latter to see how they cope. GP2, we are told, is very highly-rated by Williams which views the feeder series as its best way of recruiting promising F1 talent. First stop on the tour is the F1 simulator. We approach through a room filled with computer screens like a kind of virtual pit wall and this is, indeed, where people such as the team’s technical director Sam Michael will sit to assess the performance of a driver. The simulator itself consists of a monocoque equipped with an actual race steering wheel and pedals and today one of its engineers will demonstrate it for us visitors. The chassis can be pulled backwards to allow for entrance and egress. Once a driver is in place they are pushed forward to a position where a racetrack simulation is projected onto a surround-screen. It gives a pretty realistic impression when you’re standing behind it, so sitting inside must be a hell of an experience. Simulation engineer Jeff Calam, previously part of the test team but now seconded to this job, tells us how familiarisation with the electronic complexities of the steering wheel, and its myriad functions, is an important part of the simulator’s work and he gives us an insight into those functions. We learn that there is a KERS button, against the time when Williams installs the technology on a race car, and that the kill button, the one that stops everything stone dead, is shrouded so that a drive on full lock, say at Monaco, can’t press it by accident. The simulator has data for each track and the demonstration we are watching shows upcoming Hungary with everything in position, including black tarmac complete with lumps and bumps. The grandstands, however, are briefly-sketched patches of white. Jeff explains later that the crucial thing is to avoid giving the driver incorrect cues that will impede race performance. With this in mind, less is more, which is why Williams hasn’t gone down the road of helmet tensioning to imitate g-forces, or having the whole simulator on a moving platform. Jeff tells us about some of the uses the simulator can be put to. As well as training drivers to use the steering wheel it can allow them to practice specific tracks that they may not be so familiar with, or at which they are hoping to impress a home crowd or bring in a good result for a sponsor. It is also used for driver evaluation and the finalists in the competition that has led to our invitation today will be assessed in the simulator before a decision is taken on which one (if any) progresses to the car. On the factory floor. Pic: Williams F1. We leave the simulator and return to the lobby before being led straight past the entrance to the area where the high-level engineers and executives are based, and where they’re developing that innovative flywheel KERS system, a crucial potential source of revenue with wide applications outside racing. You need a special security clearance to get in there, with access strictly on a need-to-visit basis – and then we’re on the shop floor. It’s like the meeting of two different worlds. On the one hand it’s white-walled, high-tech, with its state-of-the-art engineering equipment, its wind tunnel, its machine shop and its composites area. There are see-through partitions and staff in shorts and neat Williams polo shirts bearing their name. On the other hand, this place is set firmly in a tradition of British manufacturing that pre-dates the Second World War with its matey, masculine atmosphere, its night shift that keeps it running 24 hours a day, its father-and-son staffers and its scheduled tea breaks. It looks different, maybe, but feels very much the same. We learn that Williams designs in excess of 95 per cent of the car and build it in-house. The exceptions are its Toyota engines, its Bridgestone tyres, the wheels and some brake components. And the McLaren ECU, of course, which is common to all teams and shows its influence in a display and a common collection of buttons on the steering wheel. Designs for the car come down from an office on the first floor, via the medium of CAD drawings, to be realised in the manufacturing area by machinists and carbon-fibre specialists. 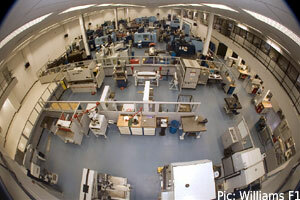 The factory employs around 500 including a race team of around 80 and also the marketing and hospitality staff. The test team is massively reduced this year and, in common with other teams, Williams did have to lose a few staff. But, with a slimmer operation that some of the bigger teams, we hear that the job losses were minimal. The team is concerned about budget caps, an interesting discovery because you would assume that Williams was one of the outfits that would have had most to gain. But it could mean “a massive reduction in staff. We wouldn’t have to lose as many as others, but you could be talking 150, 200 people. That would be massive, in a place this size.” We realise that what Williams wants is not F1’s cloth cut to fit its budget but a rather a budget that allows it to compete at the highest levels of F1. The team recruits locally, nationally and internationally with many young men on the machine shop floor following their fathers into jobs and a strong relationship between the factory and the local community. Many recruits come from Coventry University after doing placements as part of engineering diplomas and degrees. Formula One being an international sport, there are no shortage of recruits from overseas with driver Kazuki Nakajima, for example, boasting Japanese, Spanish and Irish engineers. Next on the itinerary is the race bay – a big, wide-open space with at doors at one end that is almost empty at present since the team has packed up and is on its way to Hungary. There was an 11am deadline for leaving, Wednesday being the normal travel day for a European race. Sir Frank Williams, the executives and the marketing staff will normally fly out the next morning. When we arrive the final transporter is backed up to the entrance, being loaded, and by the time we leave it has gone. The first bay is reserved for Toyota engineers to work on the engines. An interesting titbit about fuel following the end of its Petrobras deal – Williams does not currently say publicly which company’s product it uses. But we are assured it is “a local, British high-street brand” and told there are hopes for a major tie-in to be announced next year. The next three bays are race team bays – first Nakajima, then Rosberg, then the T-car. Beyond is space for the test team. Currently in this area is a hybrid that has been built for the purpose of pitstop practice with all kinds of carbon-fibre additions. The team do about 500 pitstops a year but this year the rules have changed to such an extent that it has caused a headache for the pit crews, one that is solved by setting up this practice rig. This is the drill whenever upgrades result in the slightest change to the shape of the car, so important is it that no-one is caught by surprise during a race. The actual practice stops are conducted in the truckie bay unless the weather is bad, in which case they can be done indoors. Needless to say, dispensers full of ear protectors adorn every wall. Off here is the sub-assembly area for putting together the gearbox and suspension rigs and the hydraulics department where all the hydraulic elements of the car are tested and prepared. The resulting components are then assembled in the race bay. The spare car is, these days, boxed up and flown out – with all the teams hoping and praying that nothing happens to make it necessary past Q2 because then they would be struggling to uncrate it and get it into parc fermé in time. The team takes about 26 tons of equipment to each race with everything driven as far afield as Turkey. Further afield the team uses sea freight and air freight. All the sea freight for the final four ‘flyaway’ races of the year has been on its way for a couple of months now, the six tons of consumables that can be sent in advance, at least. Between races the engines and gearboxes that must last for more than one race are taken out of the cars and sealed with a FIA barcode sticker that guarantees they haven’t been interfered with in the meantime. Breaking the seal and doing certain work is permissible as long as a satisfactory explanation is provided to the FIA. Engine use is very carefully planned and documented thanks to the limitations in force this year. Toyota specifies a maximum mileage for each engine and two FIA scrutineers spend the weekend of each race in the garage making sure everything is done as it should be. A carbon fibre seat under construction. 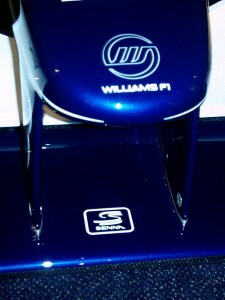 Pic: Williams F1. Next up is the R&D room (“Just behind these doors here – but no-one is allowed in”) and the composites workshop that provides all the bits of the car based on reinforced carbon fibre and epoxy resin. This, of course, covers crucial components including the drivers’ survival cells, the wings, the seats and the steering wheels. As the Williams F1 website points out, this accounts for every visible bit of the car. The area has to remain clean so, as we pass by on the way to the pattern shop, we pause to peer in through windows and see the stuff hanging on huge rolls that look like nothing so much as giant giftwrap dispensers. The process is a complex one that involves creating moulds and casting components from them, using materials that are lighter in their finished form yet stronger than steel, and capable of passing F1’s stringent safety tests. In the pattern shop we meet Brian Campbell who talks us through the process of seat fitting, often viewed as an important rite of passage for a young driver. In Brian’s domain designs and driver measurements are combined into a three-dimensional model that can then produce the carbon-fibre seat, a surprisingly labour-intensive process. To save time and money when faced with a series of young drivers visiting for evaluations, straight-line tests or simulator time, the pattern shop has borrowed a solution from US racing series IndyCar. An oversize seat is fitted with a kind of an insole equivalent tailored to an individual driver’s measurements which can be produced much more quickly and cheaply while still giving an adequate degree of customisation. But a full seat soon becomes a driver’s treasured possession. As Brian points out, once a seat is right it can become very hard to separate him from it. Back through the machine shop, getting the chance to play with a selection of discarded parts on the way. Oohs and aahs abound as we learn just how light a titanium wheel nut is, and just how heavy a piece of ballast. This is manufactured from a proprietary tungsten alloy that is among the most dense materials in existence, with the exception of depleted uranium, which is clearly not a goer. We learn that the minimum FIA weight for a Formula One car is 605kg and the Williams approach is to build the car as light as possible and then add weight – not forgetting the weight of the driver, of course. The ballast is shaped and placed along the car’s centre of gravity in the nose, under the chassis, under the driver’s seat and underneath the gearbox in order to get that magic balance. The walk of champions leading to the museum. Pic: Williams F1. Our final treat before lunch will be to visit the team museum, which is part of the conference centre building. And it’s one of the most telling and thought-provoking parts of the day, even more so than the headline bits like Sam Michael. The thing about Williams is that its eponymous team principal is everywhere, even though we never set eyes on him. Many times ‘Frank’ is mentioned by his employees. And it is in the museum that the understanding of how this whole enterprise is powered through thick and think by the purpose of one man becomes clearest. This is not to downplay the role of key team members such as Michael, Adam Parr or Patrick Head. It just demonstrates why the team is named as it is, and why the cars are all prefixed FW. 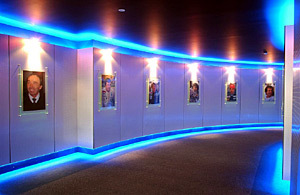 The entrance to the museum is down a curved, blue neon-lit corridor bearing pictures of Sir Frank and Patrick Head plus all Williams’ seven world champions. These are names and dates that any F1 fan will know – Alan Jones in 1980, Keke Roserg in 1982, Nelson Piquet in 1987, Nigel Mansell in 1992, Alain Prost in 1993, Damon Hill in 1996 and Jacques Villeneuve in 1997. Thing is, Williams knows its proper place in the scheme of things. Plenty of blank wall space has been left on the Wall of Champions for future development. The next stop for museum visitors is a small movie theatre which shows a short film about the team, revealing that the race-win bonus received by the cleaners is exactly the same as the one enjoyed by the chief engineer. The most striking image is one of Sir Frank is one that is shown twice, once during the film and then as its final, summing-up frame. Racing, he tells the viewer, is oxygen. After that we’re free to go into the museum itself which is wreathed in silence and darkness as we arrive. Each section is lit as necessary with the lights turned off behind us as we move on, something that only adds to the overwhelming atmosphere of the place. There are 40-plus race cars in here from three decades, many of which are quite similar to their immediate predecessors and successors, creating a clear evolutionary progress. And these are only the ones on show. Others are in storage, others in Sir Frank’s private collection. The history of the conference centre and museum building is hardly less impressive, being the facility that BMW built to launch its V12 LMR bid on Le Mans – a bid that was successful in 1999, after which Williams inherited the building. There is a video presentation for each area and we have an informed guide in the person of Scott Garrett, now director of the sponsorship agency Synergy that has arranged the competition and our visit, but previously the team’s commercial director. He’s able to swap seamlessly between the official history and an additional bit of local colour. But basically the museum is the story of one man’s life-long obsession with racing and it is impossible not to feel the presence of Sir Frank during every moment that we spend in the dim, quiet, lovingly-presented and very wheelchair-accessible rooms of the museum. Of course, let a bunch of dedicated F1 fans loose in a room like this and what you will mainly hear is the click of camera shutters, so the recorded commentary was largely talking to itself. Likewise the member of staff with the difficult job of shooing back those people standing a little too close to the cars. We’re given as much time to look around as we want before ascending a flight of stairs that takes us back into the conference centre and a hospitality area that includes displays of driver helmets, more trophies, race suits and a wall of certificates recording the complete history of the Williams F1 campaigns from foundation to the end of last season. From there, we are soon back to the conference room where we began the day. Lunch follows, and the opportunity to exchange some speculation and gossip with Garrett and with each other before we all go our separate ways. For some of us, that means heading home to hit the keyboards. But for others in the room, that means heading off to Hungary, to help Nico Rosberg on his way to fourth place. Categorised under F1, tagged under Formula One, Sir Frank Williams, Williams F1.